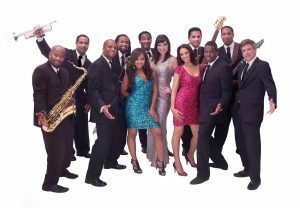 Bandleaders Glenn Carvin (keyboards) and Kenny Faison (sax) have assembled one of the most talented and versatile party bands on the scene today with a unit that stacks up favorably against any other national act. 5 amazing vocalists on the front line, 3 power packed horns and one of the tightest rhythm sections anywhere round out the line up. Members have performed all over the world with major recording artists including Aretha Franklin, Peabo Bryson, and most recently Justin Bieber, and have also appeared on Late Night with David Letterman, The Tonight Show with Jay Leno, The Today Show, Saturday Night Live, and Dancing With The Stars.